A.C. Nielsen estimated that 22,960,000 people were watching the birth of the Tribbles when “The Trouble with Tribbles” first aired on December 29, 1967 (see below for the details). So, since we all know that Tribbles, like Santa Claus, don’t really exist except in our minds and hearts, then we figure that in a single hour the existence of Tribbles went from a few hundred (in the hearts and minds of the people who made the episode) to 22,960,000 of us! And that number continues to grow. An entertaining and amusing story about the rabbits of the future called tribbles. When merely one of these cuddly, loveable animals is taken aboard the Enterprise, its reproduction rate floods the starship with tribbles. However, they do save the day for Earth and foil a Klingon plot in this light-hearted, change-of-pace story. 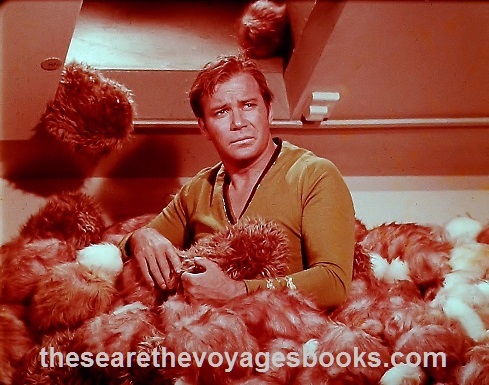 This series does not often get involved with comedy situations but when it does, it does it right, as in “The Trouble with Tribbles.” Tribbles are tiny, fluffy, purring parasites with a fantastic ability for reproduction. It is this proliferation that provides the funny moments after Lt. Uhura is given one of the puff balls as a pet and she takes it back aboard the Enterprise. It also provides the means by which Captain Kirk uncovers a murderous agent in their midst. So what about those 22,960,000 tribble births? A.C. Nielsen figured it this way: An average of two people per household times 11,480,000 households. As usual during its second season, Star Trek was second in its time period against TV’s No. 1 rated series (Gomer Pyle, U.S.M.C. ), and it was also NBC’s top-rated show for the night. And yet NBC wanted to cancel it. Go figure. Want to see all the ratings reports for all the episodes, and so much more? You can do it now, because These Are the Voyages: TOS, Season Three is finally here, and you can save when you buy "The Collectors Set", all three volumes. We have the best prices anywhere for this Saturn-Award winning book series, and all our copies are autographed by the authors.